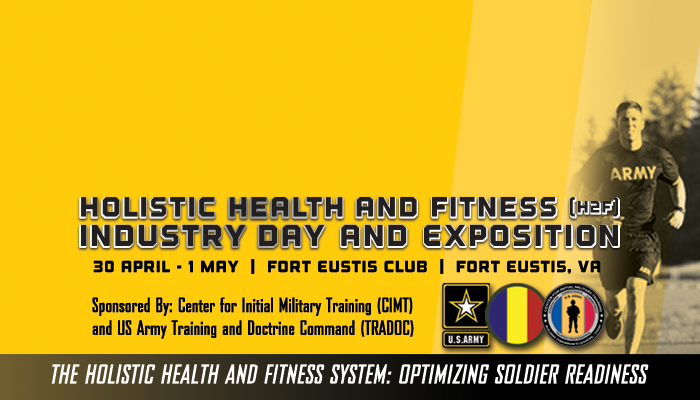 The Holistic Health and Fitness (H2F) Industry Day sessions will take place on Tuesday, 30 April and are open to all industry partners, contractors, government, and military. The sessions will feature government speakers discussing current initiatives and emerging challenges in the field of health and fitness in relation to the Army. The sessions will take place in the Main Ballroom. The Exposition will take place at the Fort Eustis Club on Wednesday, 1 May. The Exposition is open to all Fort Eustis personnel and is meant to bring government and industry together to collaborate on the latest solutions to the capabilities gaps and Categories of Research. This is an opportunity for the U.S. Army Center for Initial Military Training (CIMT), U.S. Army Training and Doctrine Command (TRADOC) to see the latest in emerging technologies, network with industry experts, and share ideas and future goals. For Senior Leadership, we offer a preview tour of the Exposition to preview the exhibits in a time-efficient manner. During the Tour each exhibitor will give a one-minute presentation of available products and services. The deadline to register is Thursday, 18 April. Download the registration form and email or fax the completed form to bollinger@ncsi.com or 443-561-2431. The registration fee will cover the cost of attending the sessions, light refreshments, session materials, professional event planning services, and event promotional materials. Please note: Credit cards will not be charged until Monday, 22 April. Cancellations must be received in writing no later than Thursday, 18 April after which you will be held 100% liable for the amount due. All sales after Wednesday, 17 April are final. NO REFUNDS, NO EXCEPTIONS. To cancel your registration, email bollinger@ncsi.com or fax 443-561-2431. You may also send someone in your place if you are unable to attend. Please see below for substitution information. All substitutions must be received no later than Thursday, 18 April. All registrants are required to provide a check or a credit card at the time of registration. Registrants must pay in advance or on-site to receive a badge. Receipts will be emailed after the event. Please indicate if you require special assistance during the event via email to bollinger@ncsi.com or call 443-561-2412.